Michele Bachmann: Evolution Of A 'Cultural Warrior' When TV news shows want somebody to enthusiastically rip into President Obama, Michele Bachmann is a reliable choice. The Minnesota congresswoman is a polarizing figure — and a Tea Party favorite. But her first presidential campaign experience came from a place today's political observers would least expect. NPR has been profiling some of the Republicans who are considering a presidential run in 2012, to find out what first sparked their interest in politics. Read more of the profiles. 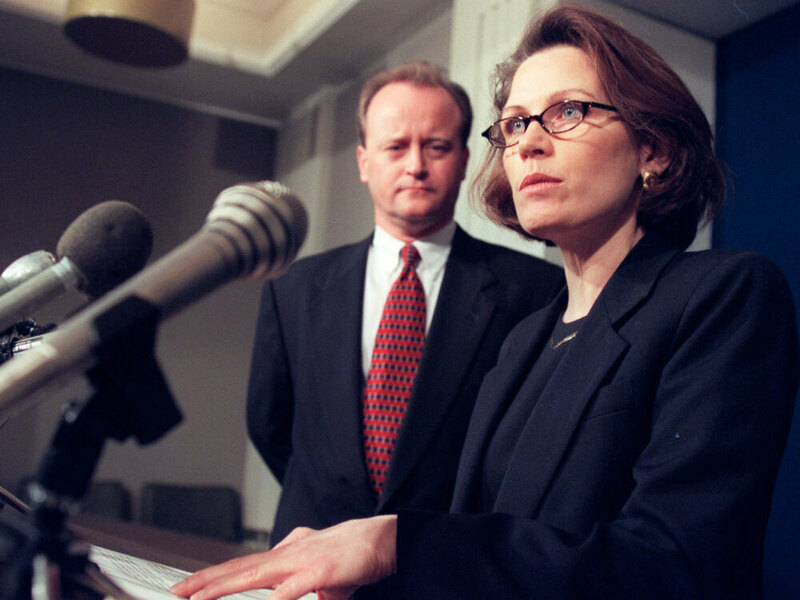 Then-state Sen. Michele Bachmann, shown with state Sen. Warren Limmer in 2001. As a state senator, Bachmann was known for taking stands on controversial cultural issues, like abortion and gay marriage. When TV news shows want somebody to enthusiastically rip into President Obama, Michele Bachmann is a reliable choice. One of her favorite techniques: comparing Obama to Jimmy Carter. "A second administration of Jimmy Carter wouldn't have done this country any favors," the Minnesota congresswoman said on one of her regular Meet the Press appearances. "We need to make sure we don't have a second Barack Obama administration." Bachmann knows a thing or two about Jimmy Carter, a secret she revealed last December in Michigan. "The first time I ever went to Washington, D.C., I went to dance at Jimmy Carter's inaugural ball," she said. "And another secret you need to know? 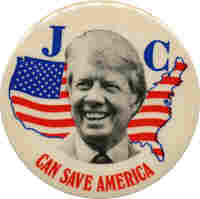 My husband and I met in college — we worked on Jimmy Carter's presidential campaign." 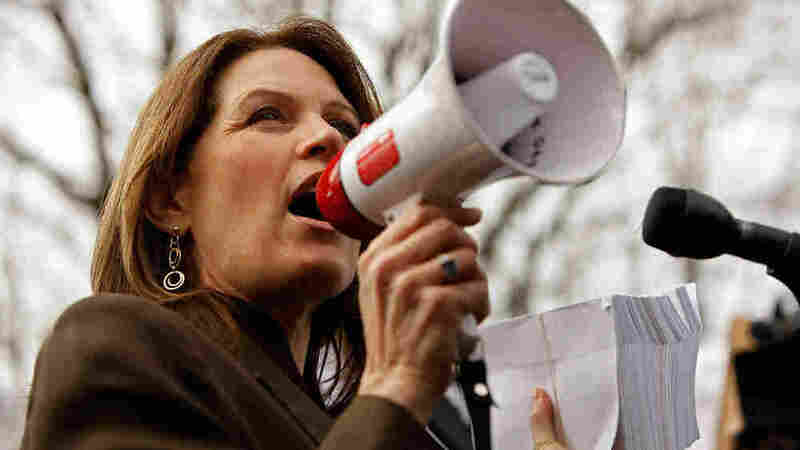 Born in Iowa, Bachmann grew up in Minnesota, where she says "Democrat" gets printed on your birth certificate. The woman who started the House Tea Party caucus was, in fact, raised a Democrat. Jerome Christenson, the deputy editor of the Winona Daily News in Minnesota, says Bachmann "was really pretty enthusiastic for Jimmy. "I think at the time," he says, "one of the things that might have attracted her was Carter's Baptist roots." Christenson was Bachmann's classmate at Winona State University in the '70s. He encouraged her to run for vice president of the student senate — a seat she won. But even though her party label changed, Christenson says, the Minnesota congresswoman preparing a presidential run today is not too different from the effusive college student he knew 35 years ago. "Stridently evangelical Christian," he says he'd call her today. But back then, he says, "we just called her a Jesus freak. Generally, the folks that promoted themselves as being Christian were pretty apolitical. They were friends of Jesus, and that was about it." Christenson describes her as a bridge between students of deep Christian faith and those of political passions. Bachmann has said she left the Democratic Party after reading a Gore Vidal novel that mocked the founding fathers. Like Bachmann, Mitch Penny, another former classmate, switched parties as he grew older. There is a real insurgent element throughout Michele Bachmann's career. ... [As a state senator], she was quite willing to engage in highly public crusades about issues. Well, guess what — that's what she's been doing in Washington, as well. "I guess going off to college, you're young and impressionable," says Penny, who is now a police sergeant in Minnesota. "You want to make a mark in the world. And as we've grown older, we've paid more attention to our pocketbooks and [are] trying to decide, are we going to be paying out too much? And if we pay too much, you're not going to have enough for everybody." Bachmann and her husband both moved over to the Republican Party, volunteering for Reagan in the 1980 campaign. She received her law degree from Oral Roberts University, and another graduate degree from William and Mary Law School. Over the years, the Bachmanns have raised five biological children and have fostered 23 kids. Between work as an attorney and a mother, Bachmann didn't re-enter politics full time until 2000, when she won a Minnesota state Senate seat. Steven Schier, a political scientist at Carleton College in Minnesota, has tracked her political career from the beginning. "As a state senator," he says, "Michele Bachmann was primarily a cultural warrior," campaigning outside abortion clinics and vocally fighting against gay marriage. Six years after she joined the state Senate, Minnesotans sent her to Congress. "There is a real insurgent element throughout Michele Bachmann's career," Schier says. "She was never a favorite of the legislative leadership when she was a Republican state senator. She was quite willing to engage in highly public crusades about issues. Well, guess what — that's what she's been doing in Washington, as well." Bachmann's political base loves her style, and it makes institutional Republican leaders cringe. Her rhetoric is always colorful — and occasionally wrong. The nonpartisan website PolitiFact has evaluated 21 Bachmann statements. None were rated "true" or even "mostly true" — 16 were just false. Match Game: What Inspired These Republicans? The night of the president's State of the Union address in January, Bachmann gave Republican leaders another headache: She offered her own Tea Party response to the president's speech, just after the official Republican response. "We believe in lower taxes," she said then. "We believe in a limited view of government and exceptionalism in America." Bachmann has been an enthusiastic booster of the Tea Party movement. And her style is widely compared to another potential Republican presidential contender, Sarah Palin. Schier sees one key difference. "I think Bachmann has identified herself more with social conservatism throughout her career and is, I think, a more undiluted social conservative perhaps even than Sarah Palin." In short, Bachmann is not bland. The risk of her candidacy is that the same spiciness she uses to fire up the conservative base might burn her when she needs to appeal to a broader audience.